Not every singer can easily achieve intimacy; Gail Marten has thoroughly mastered the art. Ms Marten is still endeavoring to attain a similar level of perfection with intonation, yet her latest album is a joy to behold. That is mainly due to her knowing approach to ballads. I don’t mean that corny old line about being able to tell a story. Gail’s strength lies in her deep understanding of the emotions that well-crafted lyrics convey, and above all, her impeccable taste. Her choice of material — agreed to by her accompanist, pianist/arranger Larry Willis — reveals her knowledge of, and appreciation for, the Great American Songbook. Prime examples are her interpretations of “Skylark,” “Alfie,” “Never Let Me Go” and “Cry Me A River.” What they all have in common is they tend to separate the women from the girls, the professionals from the ingénues, the cabaret hip from the jazz pretenders. Each of those tracks is given a heart-wrenching reading. When Willis alone backs her, Ms Marten is able to plumb the depths and soul of the lyrics in the ideal dramatic atmosphere: rubato, as they do in “If He Walked Into My Life” — to this pair of ears, the high point of the CD. That in no way infers that Willis’ rhythm mates — bassist Herman Burney and drummer Eric Kennedy — fail to carry their weight. Au contraire, Burney’s pedal points on the fifth add just the right touch to “Alice In Wonderland,” a 3/4 bouyancy that Kennedy’s subtle brush work enchances. Both “Where Do You Start?” and “You Must Believe in Spring” reveal Gail’s ability to stretch her high range as well as cope with sudden modulations They also show her preference for the literate eloquence of the Bergmans, whether it be lavished over the changes of Johnny Mandel or Michel Legrand. 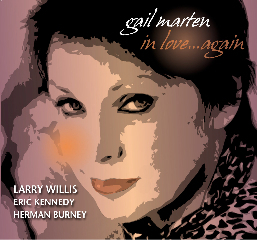 “Hello Young Lovers” (one of Willis’ cleverest charts) — a juxtapostion of bright bossa and uplifting jazz pulse in the release — proves that Gail can swing, when she wishes to. Another talent she can call on whenever the Muse allows, is her lyric writing. Her witty “Reinventing Me,” a collaboration with Clem Ehoff, includes her plan to “reconstruct my derriere,” among many other revisions. Her self-improvement project breaks me up every time I hear it. The album is dedicated to Shirley Horn, who put Marten hip to Larry Willis around six years ago.